It is Muromachi period Japan (the 15th century), and the relationship between man and nature is in a constant state of change. Even the old gods of the forest are in danger, as humans start taking control of the land from them. On one side is proud Lady Eboshi and her iron-making settlement of Tatara Ba, where outcast men and women make new lives for themselves forging tools and weapons of iron ... which requires vast quantities of wood to produce. Opposing them are the animal gods, among them the Wolf God Moro, her two sons, and her adopted human daughter San, the Princess Mononoke, who has renounced her humanity to fight for the forest. Both sides have honorable motives ... and into this fray comes Ashitaka, an Emishi ("barbarian") from the North, who seeks respite from a curse inflicted by a corrupted Boar God who attacked his village. His efforts to bring peace between the gods and humans is countered by the greed of Imperial agents and samurai, and the pride of the opposing parties themselves. But at what price does pride come, when the very land is at stake? Princess Mononoke is one of the highest grossing films in Japanese history, and newspapers and Internet sites have been singing its praises ever since it came out. Naturally, when I had the opportunity to view a digital source of this, I had to see it, even if it was a fuzzy third-generation tape. I have since seen this movie in the theaters, as well as on DVD, and I'm happy to say that, while the dub job isn't universally perfect, I found most of it to my liking. The unorthodox choice of Billy Bob Thornton as Jiko Bo struck a lot of fans the wrong way, but I rather enjoyed his take on the character. Minnie Driver's rendition of Lady Eboshi was absolutely astounding, and Billy Crudup is serviceable as Ashitaka. On the other hand, I wasn't too keen on Claire Danes as San. More than once, she delivers lines that are far too flat for the emotions being expressed on the screen. Overall, though, it's a decent dub job and worth viewing for a change of pace. Miyazaki Hayao has proven himself yet again a master in his trade, and his work deserves no less than the highest praise I can give it. 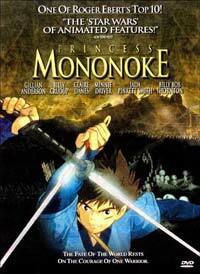 However, do keep in mind that this isn't the usual Ghibli film, and those expecting a slow-paced film a la Totoro or Porco Rosso will be rudely surprised, but on its own merit, Princess Mononoke stands on its own, and stands tall, at that.